Food shows are my background noise when I'm home. They're happy, and it's always interesting to which to listen. Though, right now my background noise is the Hallmark Channel - I love the Christmas movies! Last year, I caught an old episode of Rachael Ray where these mini lasagna cupcakes were featured, and they were an appetizer at my party. When I have my Christmas party, I always try to find appetizers that work as finger food. It's harder for people to stand around and mingle if they have to balance a plate with forks and knives. I had no leftovers when I made these - a sign of a successful appetizer in my book! 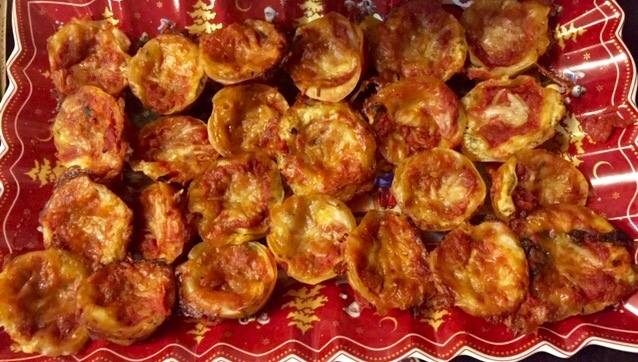 For these lasagna bites, pull out your mini muffin tin! Instead of lasagna noodles, won ton wrappers are used. I took a small jar lid and placed it on top of the won ton wrappers to cut them to fit the muffin tins. After that, you make up a traditional lasagna cheese base with ricotta, mozzarella, and parmesan. Then, just layer between the cheese mixture and tomato sauce. You can prep these a day ahead and bake right before your guests come over. The hardest thing about making these? Finding won ton wrappers! It took four stores to find them! Spray a mini muffin tin with non-stick spray or grease with butter, and set aside. Preheat oven to 350°F. In a medium bowl, mix the three cheeses egg, salt, and pepper, and set aside. Cut the won ton wrappers with a small cookie cutter so that they will fit into the muffin cups. Set aside, and cover with a damp paper towel so they don't dry out. Add a heaping teaspoon of sauce to the bottoms of a greased muffin tin. Place a won ton wrapper over the sauce, then add some cheese, and then add another won ton wrapper. Repeat and top with some of the cheese.